Considered the “Academy Awards of Human Capital Management,” the Brandon Hall Group Excellence Awards are the most prestigious in the HCM industry. “Excellence Award winners symbolize the power and impact that Human Capital Management practices can have on a business or on any organization,” said Rachel Cooke, Chief Operating Officer of Brandon Hall Group and awards program head. Zurich Insurance, a 53,800-strong company headquartered in Switzerland that provides services in 210 countries, won the Silver Medal for ‘Best Use of Blended Learning’. CrossKnowledge built a comprehensive program that delivers feedback, training, recognition, and ongoing learning support for people managers on their leadership development journey. Within the first six months (July to Dec 2016), the total number of learners logging-on increased from 1062 to 4047, the number of active learners increased from 643 to 2523, and the average learning time increased by 70% – from 1 hour to 1.7 hours per active learner. L’Oréal won the Bronze Medal for ‘Best Advance for Corporate Learning University’. The MyLearning portal is powered by CrossKnowledge and benefits from 200 learning professionals worldwide. Digital learning has increased sixfold in the 4 years since the launch of the corporate university program, which manages training for the Company’s 88,000 employees. The university boasts more than 40,000 regular users and offers more than 7,000 learning resources to their international workforce – anytime, anywhere, and on any device. Pandora, an international Danish jewelry manufacturer and retailer founded in 1982, won the Bronze Medal for ‘Best Advance in Learning Technology Implementation’. The implementation of their CrossKnowledge learning platform quickly led to tangible benefits. Efficiency and ease of use has improved, including the reduction of the number of clicks required to access relevant content. The usage of e-learning content has dramatically increased with almost 9,000 hours logged within 20 days. Productivity has also improved, with time spent away from the shop floor being reduced. Finally, engagement has been increased due to the localization and availability of content in over 23 languages. 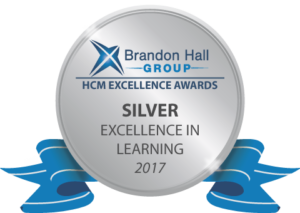 Excellence in Learning Award winners will be honored at Brandon Hall Group’s HCM Excellence Conference January 31 – February 2, 2018, at the PGA National Resort in Palm Beach Gardens, Florida.